J Box: Listed for feed through wiring. Five 1/2″ knockouts with true pry-out slots and four knockouts with Romex cable clamp. Ground wire provided. 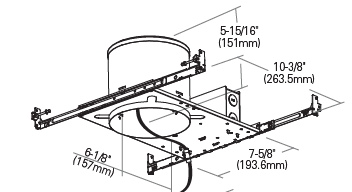 Bar hangers: Pre-installed allowing for position at any point w/in a 24” joist span. Can be turned 90⁰ on plaster frame, & to fit T-bar spine w/out additional clamps for use in drop ceilings.